If you are not in the hospital or on a business trip? There is a solution supporting your work mobile wherever you are. The central key advantages of VIMED® MOBIL are broadband audiovisual communication in HD quality, both between two healthcare professionals (e. g. second opinion) as well as between the physician and the patient. 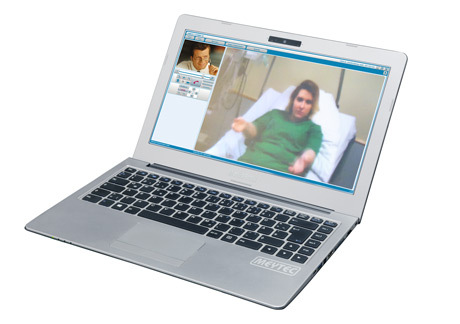 Equipped with a powerful Intel® Core processor and with Solid-State-Drive (SSD), the system provides a audio-visual communication in telemedical real-time applications, such as telediagnostic, teletherapy, second opinion or case discussions. The modular telemedicine system can be provided, depending on the equipment and furnishing, with management software for sharing and editing of DICOM data. This allows integration into the existing RIS (Radiology Information System) or PACS (Picture Archiving and Communication System) of the user.